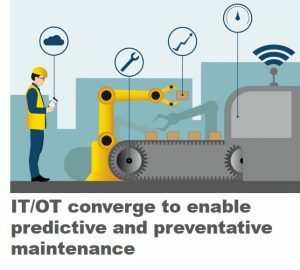 Since the advent of the Industrial Internet of Things (IIoT), experts and enthusiasts have been talking about the coming together of IT (information technology) and OT (operational technologies). Some call it an integration, while others call it a convergence. I call it a good thing. 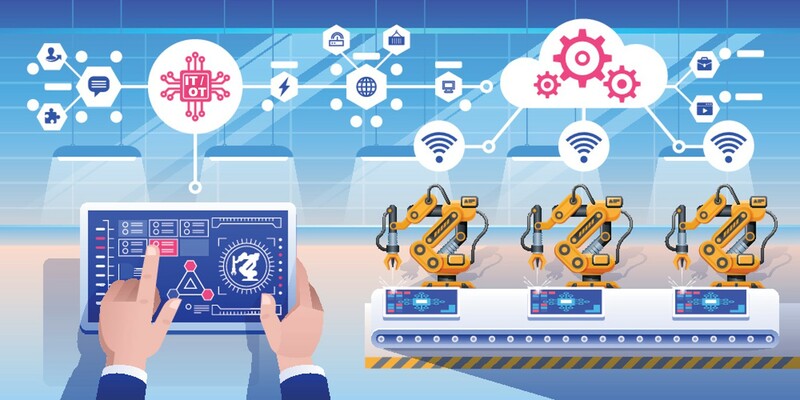 In this post, I’ll talk a bit about the convergence/integration of IT and OT, why it matters, and what it will look like in the Factory of the Future. Other definitions offer variations on the theme. 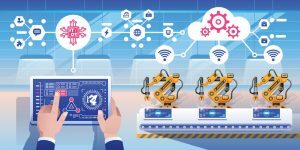 More detailed definitions, for example, might focus specifically on operational technologies such as the billions of connected devices that make up the IIoT. Machines talking to each other, seamlessly improving operations without any human intervention. Maybe. Someday. 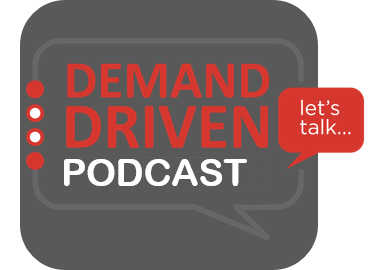 In the meantime, the most vital convergence that needs to happen is the coming together of your IT and OT people. To be clear, I’m not talking about the next big trend in organizational restructuring that merges IT and OT teams into one. 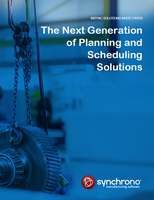 I doubt most of you would want your IT technicians managing production schedules any more than you’d want your plant managers configuring your network. The skills and knowledge required are vastly different. What you want to see is the two teams working together to solve problems. 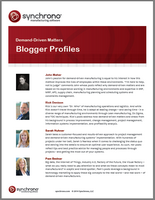 In the convergence of IT and OT, each side has something valuable to offer. If you’re in operations, you need the folks in IT to make your ideas work. For example, let’s say you want to implement predictive maintenance in your organization to reduce unplanned downtime. You either purchase or retrofit your equipment with intelligence, and you invest in applications like SyncView® to improve shop floor visibility. At a minimum, you’ll need to collaborate with your IT team to make sure that your connected devices (both the shop floor equipment and the handhelds you use to access the real-time information) are secured, so they don’t increase your organization’s cybersecurity risk profile. Connecting devices also increases the traffic on your network. IT can be instrumental in ensuring the IT infrastructure is architected to provide the level of performance you require. While I don’t imagine there are a lot of IT professionals reading our blog, understanding the benefits of IT/OT convergence from the perspective of the IT professional can help you foster willing collaboration between the two teams. CIOs and other high-ranking IT professionals are under increasing pressure to add value to the business through digital transformation. In the 2018 Gartner CIO Agenda Report, 17% of respondents said digital transformation was their number one priority. While 17% may not seem like a large percentage, keep in mind that this 17% ranked digital transformation over other important priorities like profit improvement (10%), innovation (10%), and customer focus (9%). The only priority that topped digital transformation was growth/market share at 26%. The challenge for many IT professionals lies in defining exactly what digital transformation means to the organization. 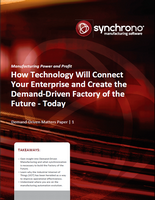 It is NOT simply putting more mobile devices in the hands of factory floor employees. For digital transformation to be effective, it must add value to the business. OT professionals can help their colleagues in IT by providing a reason and a method behind their digital transformation initiatives. Take pull-based replenishment as an example. In pull-based replenishment, production is tied to customer demand, and materials are only replenished once they are consumed. 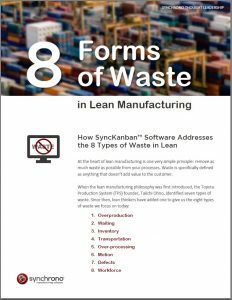 While pull can help eliminate many of the eight types of waste identified by Lean Manufacturing, it provides two important bottom line benefits as well: Decreased cycle times and decreased inventory levels. 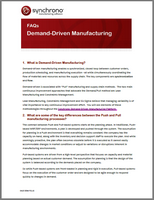 Pull is a vital principle in Demand-Driven Manufacturing. Kanban systems are undoubtedly the most common method for implementing pull-based replenishment. However, manual Kanban systems are fraught with challenges such as human error and lost cards. They can also introduce the waste of excess motion into the system as workers move Kanban cards around the factory floor. eKanban replaces manual Kanban with connected devices that send electronic demand signals. No more unexpected stock outs due to a lost or misplaced Kanban card. As an example of how much more efficient eKanban is, consider that one of our customers replaced a manual Kanban process consisting of 66 steps with an eKanban process with only six steps. 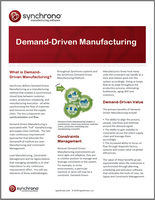 At the same time, they reduced replenishment inventory by 40% and their lead time from 12 weeks to two. In the Factory of the Future, I envision IT/OT planning meetings to be every bit as common as the weekly S&OP meeting is today. That’s because, without the convergence of IT and OT – and the people behind these technologies – the Factory of the Future doesn’t exist. If you have comments or questions on this article or any of the concepts we’ve discussed, please add them below or reach out to me directly.